Now this is dedication to your craft. It's just like that scene in Terminator 2: Judgement Day where the bad dude rises out of the floor. 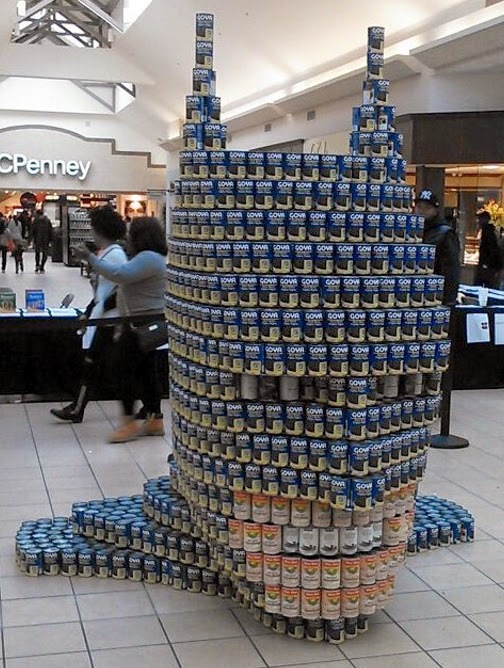 Except this is Batman and made of Goya Bean cans. Now, if I was made to do this I would put one can in place, eat a can, place one, eat one.. and that's when I'm thinking of the cans as baked beans! If it was beer, there would be no chance. Not even a miniature Bats would stand a chance. And if supermarkets did more of this I'd be more tempted to step inside the vegetable isle! Batman: he's EVERYWHERE. Even in your beans! CRIMINALS BEWARE. You got that right Pensol - EVERYWHERE!